Meet the Precision Cooker — a sous vide device made by Anova. 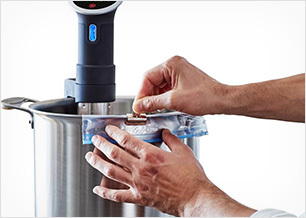 Once the best-kept secret of professional chefs, precision cooking or "sous vide" is now available for the home cook. To cook sous vide, you place food in a plastic bag and immerse it in a water bath. Water gently circulates around the food, bringing it to a precise temperature and providing consistently amazing results. The Anova Precision Cooker connects to your phone, so you don't have to search for time and temperature settings — you just hit a button and start cooking a fantastic meal. Simply download the app, season and bag your food, schedule the cooker and go. 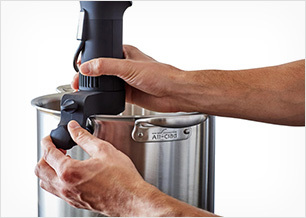 Attach the precision cooker to a pot with the adjustable clamp. Use the app to find your cook settings and hit 'Start.' Or use the precision cooker's simple interface to set the time and temperature. Prepare your food and place it in a resealable bag. Clip the bag of food to the side of the pot and let your precision cooker do the rest. 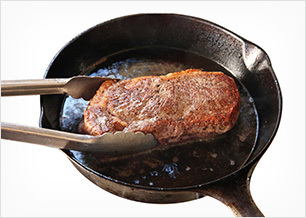 Some people like to finish cooking by searing their food, throwing it on the grill, or broiling it. This gives the food a nice look and a crispy outer layer. Precision cooking enables you to produce results that seem impossible to achieve through any other cooking method. You won't find dry edges or rare centers. Juices and flavors don't escape. Food comes out perfectly moist and tender. This Precision Cooker connects via Wi-Fi to the Anova app, so you can get professional results no matter where you are. Simply choose what you're cooking and how you like it cooked, and it will be ready to go the moment you are.